To make your Granary experience complete here’s something that you really must have! isbn: 1874092 82 6. 200 illustrations 256 pages. Published on 2nd December 2003 by Broadcast Books. Over 1,500 groups and artists appeared at the Granary Club during its 20 years as Bristol’s foremost rock venue. Al Read was a major player in the club’s history as club DJ, entertainments booker, licensee and publicity organizer. Whilst booking the artists for the club, Al kept a diary of who was booked and the fees that were paid and this diary formed the basis of the book. Its a complete listing of practically everyone who played there, along with photographs, anecdotes and personnel. An entertaining and informative read as well as an intimate glimpse into the rock club scene of the Seventies. 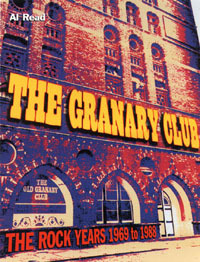 NOTE : The Granary book is no longer available from the Granary Club web site as our stock is now completely sold out. Copies both new and used are available on Amazon books and on Ebay. On Amazon prices range from £7 including post and packaging for a secondhand copy and £12 for a new copy. You can also pay £49.80 if you’re as daft as a brush. On Ebay copies for auction can be found for a starting price less than £5 whilst “Buy Now” copies are around £15. We would like to send congratulations to Paul Dowse of Poole, Dorset who bought the last copy in October 2013 almost 10 years after its publication.